While this is truly a significant achievement for emergency communications—and the result of hard-fought efforts from public safety—this is only the beginning. The FirstNet Authority looks forward to continuing to work closely with public safety to support their adoption and use of the network, but also to be a zealous and steadfast advocate for public safety. As the FirstNet solution evolves and grows, our Advocacy team will remain engaged with the public safety community to ensure that it meets the needs of public safety. With this approach in mind, over the past six months, the FirstNet Authority’s Public Safety Advocacy team has participated in more than 500 engagements reaching more than 28,000 stakeholders across the nation. These engagements have taken place at every level and at every phase of growing the solution. 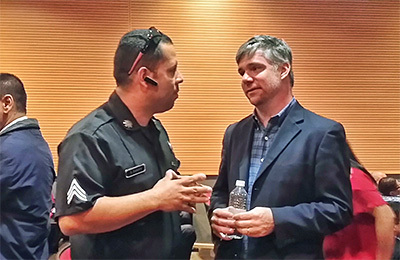 Our team has had the opportunity to meet with public safety stakeholders and industry at national, state, and local conferences; open town halls; planned events and demonstrations; state-specific outreach meetings; and agency-specific outreach meetings at the local, state, tribal, and federal levels. From these engagements, our team has gained a better understanding of the community’s needs and how to be the best advocate for public safety. Building upon this momentum, the FirstNet Authority has initiated a renewed advocacy program to educate, inform, and collaborate with public safety stakeholders. Through these efforts, the Public Safety Advocacy team will tailor engagements to gain a better understanding of public safety’s specific mobile broadband needs and to share the lessons learned from current use of FirstNet. In turn, the team will use these opportunities to help public safety better understand FirstNet offerings and how to integrate them into their operations. By involving public safety at every phase of building, deploying, and operating the network, the public safety community will influence the successful implementation and evolution of the FirstNet solution and products. The Public Safety Advocacy team will ensure that your voices continue to be heard and your needs are reflected in YOUR network. As we move forward with our updated advocacy program, we are also launching a new platform to bring you the latest from our work in the field with public safety—the Public Safety First podcast. We want to leverage this podcast to connect with you, grow our community of first responders, and bring valuable conversations about FirstNet directly to you. We will take this podcast into the field to interview police officers, firefighters, paramedics, and other first responders—and to share your experiences and best practices with the public safety community. We hope you join us! Click here to listen and learn more about the Public Safety First podcast, and be sure to subscribe on SoundCloud, iTunes, and YouTube.